One of the most fundamental rules of business I've ever heard is that products need to be priced independent of cost. This is also cited as the most common rookie mistake, the idea of costing out a product and slapping a fixed margin on top. "You've gotta charge what the market will pay, otherwise, you're leaving money on the table!" "If you just put a margin on top of cost, then the price wars will begin, and you're just going to keep discounting and discounting until there's no margin left"
The Open Source Hardware Bank has gone against that rule entirely. The price was deliberately assigned as a roughly 15% margin over cost, which was estimated and made apparent upfront. But then again, the goal wasn't to "maximize profits (and take over the world)". It was simply to make a piece of hardware accessible and feasible to build, and to offer a modest reward for everyone who helped make it possible. So it may violate the rules of conventional business, but this paradigm of "Open Source Pricing" works for the sake of turning an idea into reality. Then what happens when the cost estimates were a little too high to start off? Business rules would say you keep the excess margin, but following the 15% over cost model, the price would be reduced accordingly. So as it turns out, building the TripleWide Extender X was much cheaper than expected (in part because of similarities in production to the DoubleWide, and taking the final assembly in-house to get them out faster). With an original anticipated cost of 31.53, the price was 36.26. And so the "Buy 1, Build 1" cost was 67.79, and folks who helped fund it would have received one TripleWide and a check for 36.26 in return. As it turned out, the TripleWide X, Illuminato compatible (double rows of headers) cost 24.87 to build, keeping a constant 15% margin would result in a price of 29.26. The real question is then, what happens to the people who have funded one at 31.53, expecting their 15% return after it sold? Well, the difference in cost still goes back to them. for a total of 67.79.
for a total of 54.13. A lot of people who just got their ButtonShields were asking about how they could get up and running, so I decided to put together a short summary sheet for the ButtonShield. It goes over all the different parts of the ButtonShield, from the arduino communication libraries to how each of the buttons are mapped. I've put it up on the Liquidware site over here. Let me know if there's anything else I should add, or cool things to do with it! A sneak peak at the new liquidware.com cart system shows how it's much easier to checkout using just your credit card. This is a huge improvement over the paypal account system. To which I replied, “PSYCH! 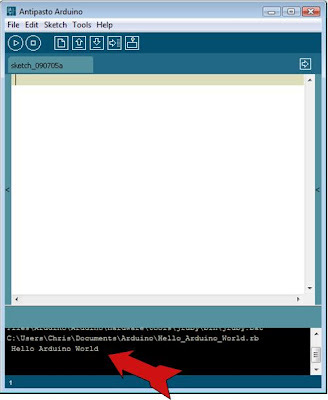 Actually, it’s supposed to be there, and you’re the first person to discover that easter egg!” There are other easter eggs on the TouchShield Slide, but this is the first one that anyone’s found. This Book Sounds Like Me! "Makers tells the story of a group of hardware hackers who fall in with microfinancing venture capitalists and reinvent the American economy after a total economic collapse, and who find themselves swimming with sharks, fighting with gangsters, and leading a band of global techno-revolutionaries." The fact that IBM doesn't even make their own computers anymore. Yeah, what the hell? So I guess I don't really have any other choice than to say, ... I will buy this book, and definitely look forward to reading every page. I just hope it ends up well! Viva la hardware hacking microfinance economic rebuilding techno revolutionaries! Scripting languages have evolved a lot in the recent years. Ruby in particular, has had such a significant impact, that there are entire teams dedicated to maintaining it's visual identity across the web. Designed by Tom Schaub is a widely used logo for the ruby programming language. 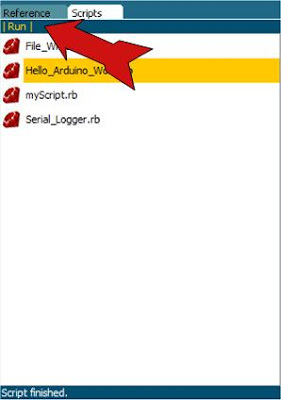 Sporting some flashy ruby icons, is the Scripting tab in the Arduino IDE. Upon startup, a listing of your ruby script files is generated from your Sketchbook directory. Of course there's no scripts in there, you need to crack open your ruby reference and create some. Once you do, you'll see how easy it is to automate repetitive tasks. 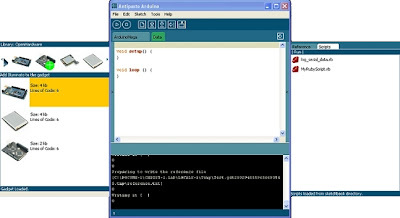 Ruby scripting support is built into the Antipasto Arduino IDE in versions 0.8.11 or greater.